Gold for USBF Bermuda Bowl, D'Orsi & Youth Teams! 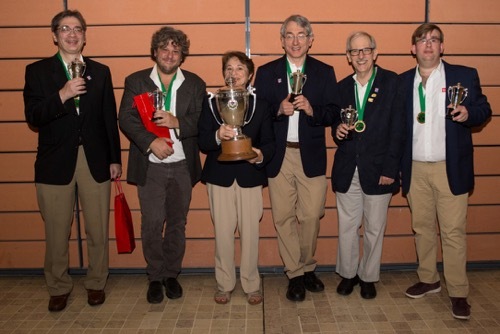 Congratulations to the USA2 teams in the Bermuda Bowl, D'Orsi Cup & Youth teams, all of whom won gold at the 2017 World Championships! 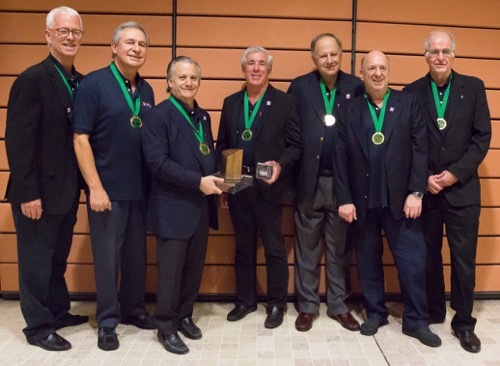 Michael Rosenberg, Brad Moss, Jan Martel, Marty Fleisher, Chip Martel & Joe Grue (Jacek Pszczola unavailable for photo). Photo by Francesca Canali. Steve Garner, Mike Becker, Jeff Wolfson, Neil Silverman, David Berkowitz, Alan Sontag, Allan Graves. Photo by Francesca Canali. Youth: Adam Grossack-Zack Grossack, Adam Kaplan-Christian Jolly, Kevin Rosenberg-Anam Tebha. Zack Grossack, Adam Grossack, Adam Kaplan, Anam Tebha, Kevin Rosenberg, Christian Jolly. 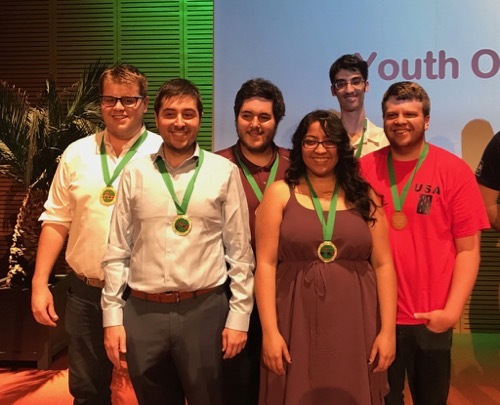 The United States Bridge Federation junior training program, directed by Michael Rosenberg, provides players under the age of 26 with USBF mentors to improve the quality of our junior teams in international competition. As part of the program, practice sessions are held on Bridge Base Online (BBO), where the juniors play team matches and the mentors analyze and comment on their play. The matches are 15 boards, IMP scored, and take about 90 minutes. The program has instituted “Celebrity Guest Night”, where, once a month, a world-class player partners a junior and plays in a team match. On Monday July 17th, beginning at 7pm Eastern time, the celebrity guest will be Richard Pavlicek. Larry Cohen and George Jacobs will provide expert commentary. Kibitzers are invited to watch by logging into BBO, going to the “Vugraph room” and joining the tables designated “USBFJR.” Among the celebrities who have participated in Celebrity Guest Night are Bob Hamman, Geoff Hampson, Jeff Meckstroth, Brad Moss, Mike Passell and Eddie Wold. The USBF is most appreciative of the voluntary contributions these top players are making to assist the program. The Open, Women's, Senior & Mixed USBCs in 2019, 2020 & 2021 will be held at the Hyatt Regency in Schaumburg. The hotel has confirmed availability for the dates we asked for, so these are now set, subject to possible change if the WBF schedules the World Championships for dates other than September in any of the years. See Future USBF Events page for specific dates.